Terraria is one of those games that hit the sweet spot for many co-op lovers. It was released for the PC back in 2011, and blended the best parts of Minecraft and Zelda to create a unique 2-D experience. There were a myriad of tools to discover and treasures to keep, bosses to fight, and a very strong community to support it all. The developers were very passionate about the project, and continue to deliver exciting content to this day. Most of us have dreamed of a console port, and this week our prayers are being answered. 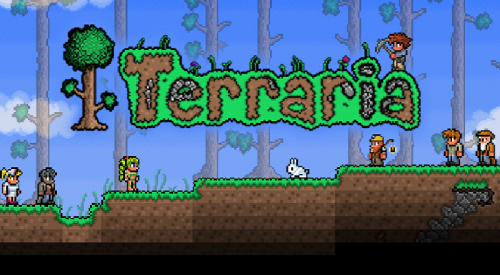 Terraria will be releasing on the PSN tomorrow and on the XBLA on the 27th. It will retail for $14.99, or 1,200 Microsoft Points. This version of Terraria will be a boon for cooperative gamers who own a console. It will feature both a single-player mode and cooperative play mode. There will be an invite system to use in-game, where a host can invite up to seven other players to play cooperatively (or competitively). You can also play with up to four players locally through splitscreen means, just like in Minecraft: Xbox 360 Edition. 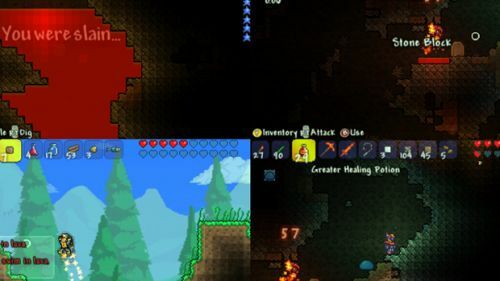 The console versions of Terraria will feature special content, including a custom interface and an additional boss. Look for Terarria to release later this week. Page created in 0.3539 seconds.